Watch this JMS presentation on storage solutions for biosolids. Greg Hyde, Product Manager | Material Handling from JMS, talks about live bottom hoppers, silos, and storage bins. This presentation also talks about the best practices for designing biosolids storage solutions for dried and wet sludge. Storage solutions are used in Wastewater Plants all over the world. They are used, for both wet biosolids applications and dry biosolids applications. The most popular styles of biosolids storage used in plants are solos, live bottom hoppers, and bins. 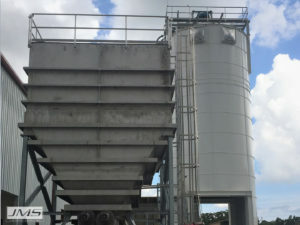 Silos are a cylindrical storage for both dry and wet sludge but are more often used in dry sludge, or lime applications. Silos may be, but are not typically used in wet sludge applications, mainly due to the plants desire to utilize stainless steel equipment. The larger bolted silos are not available in stainless steel. A silo can be shop welded in stainless steel if the diameter of the silo is less than 14’ (dependent on shipping logistics). If it is greater than a shippable diameter it will require a site-bolted, coated carbon steel silo. Hoppers are square or rectangular storage vessels for wet sludge applications. Hoppers can be either shop welded up to a shippable size or they can be field welded for larger volumes. JMS has supplied volumes of up to 500 cubic yards usable; higher volumes are possible. Internal tension bars and external reinforcements are required especially on these larger hoppers making them structurally sound and able to meet appropriately dictated seismic and wind loads. Hoppers can also be outfitted with live bottoms for distribution to either pumps or a truck load-out. What would the base cost be for a silo for dried biosolids at 12,000 cubic yards. I will get this sent to our Material Handling Product Manager for you and he will be in touch with you about this.